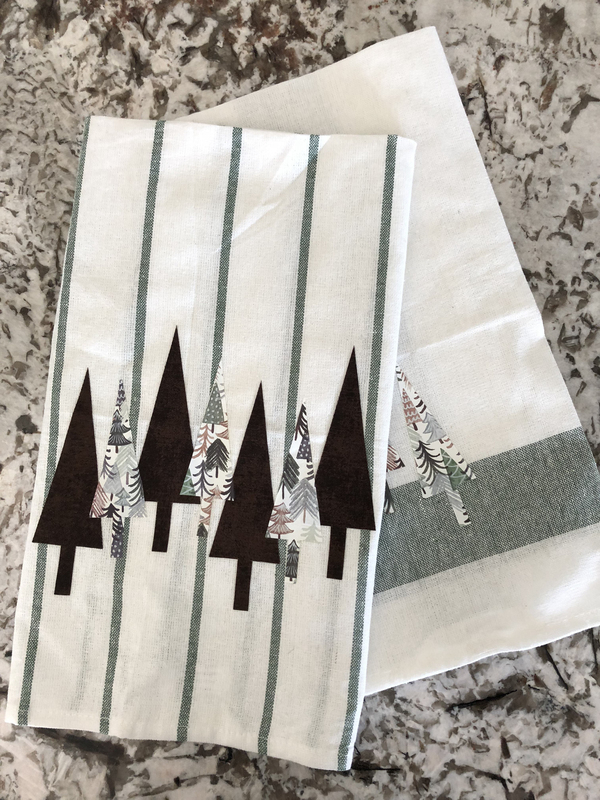 Oh, it’s time for the next stop of our holiday preparation – let’s get our kitchen and dining rooms ready for their debut! To start at the beginning, check this out: Mantel Collection. As usual, let’s jump into the supplies list. 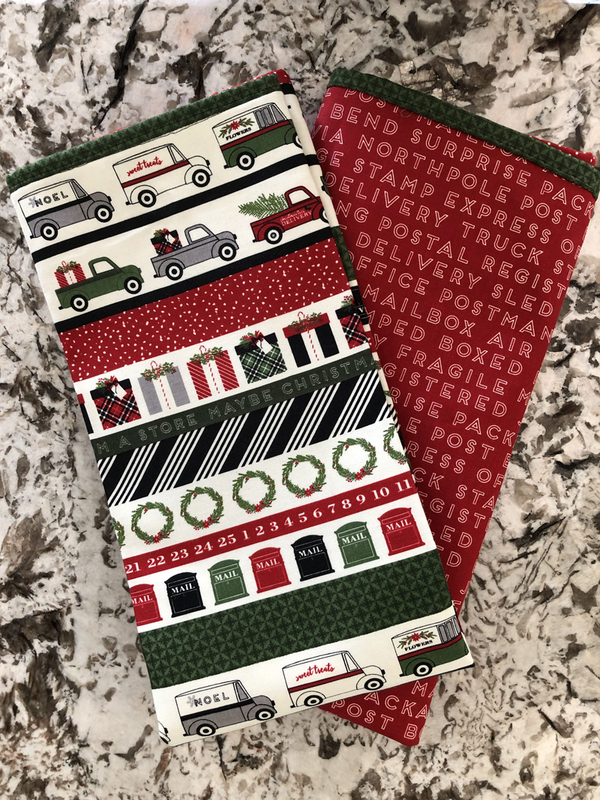 Order the supplies you need and get an extra discount with our special holiday promo code: 8WEEKDIY for an additional 10% off all your materials (excludes Cricut machines & Cricut Access and needs a $50 minimum purchase). We’re using the same color palette – white/cream, grey, forest green, black, and a few scattered pops of red. 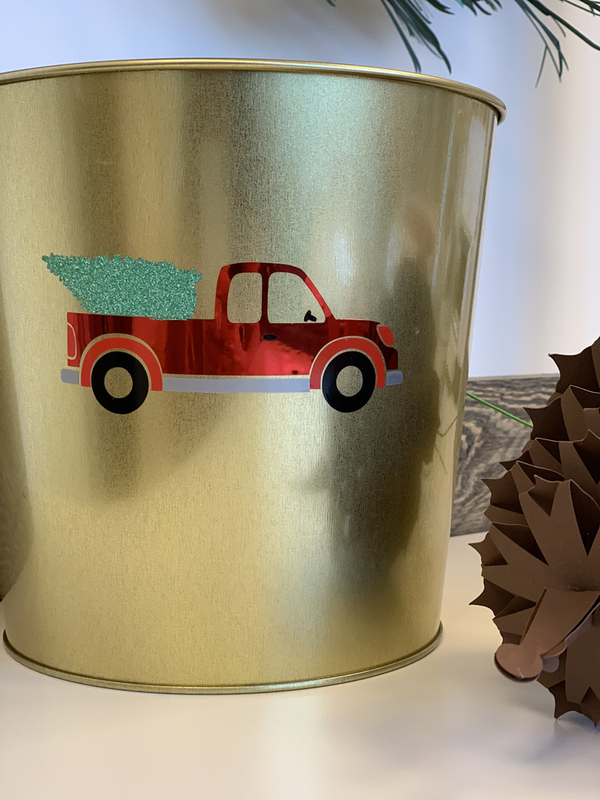 You’ll see the same imagery too – vintage trucks and pine cones. 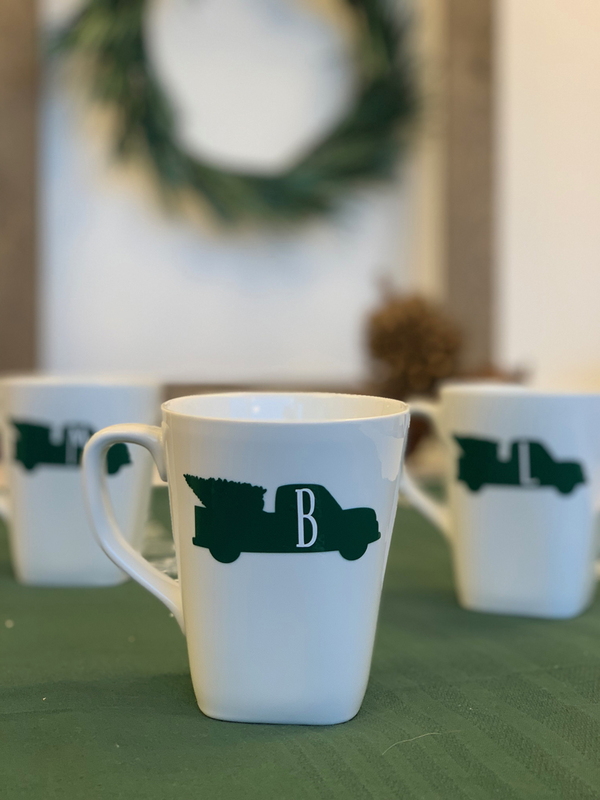 Let a warm, cozy drink fill you up with a great set of mugs that you can customize with either your last initial monogram or your family’s first initials! Simply slice out the letter from the truck image in Design Space, and you’re all set! 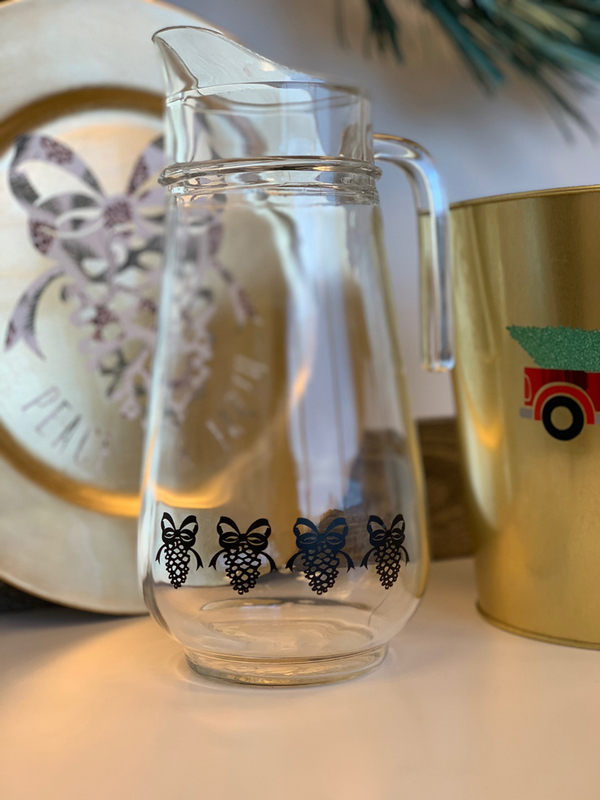 Pinecones are on both the glasses as well as a dainty pitcher. This is something you can easily break out for an evening with friends without having to dress up an entire tablescape! And it still fits into your house holiday theme. 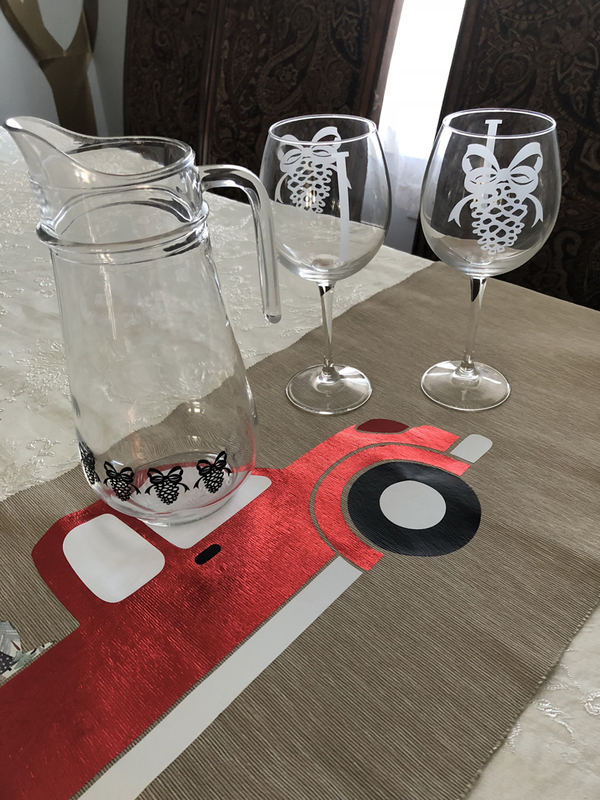 Once again, the layering on the ice bucket as well as the reversible table runner is the key piece to getting the truck right. I forgot this in my excitement and energy (and love of a fast craft!) and ended up ironing on over my steering wheel piece of the truck. The layering order is really important so head over to our instructions in this post. 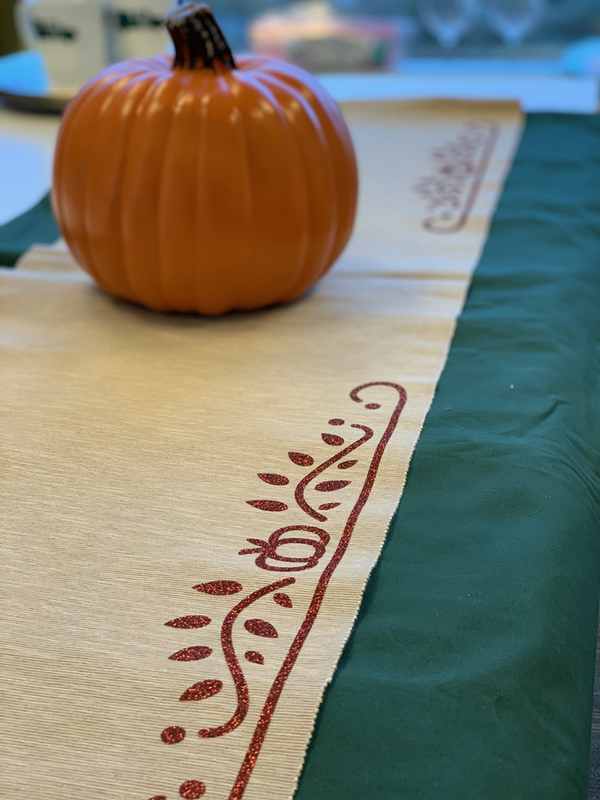 The best part about this reversible table runner is that we snuck in a little Thanksgiving too so you can instantly go from one holiday to the next while you get out all the rest of your décor later! The chargers are also something that you can use interchangeably! 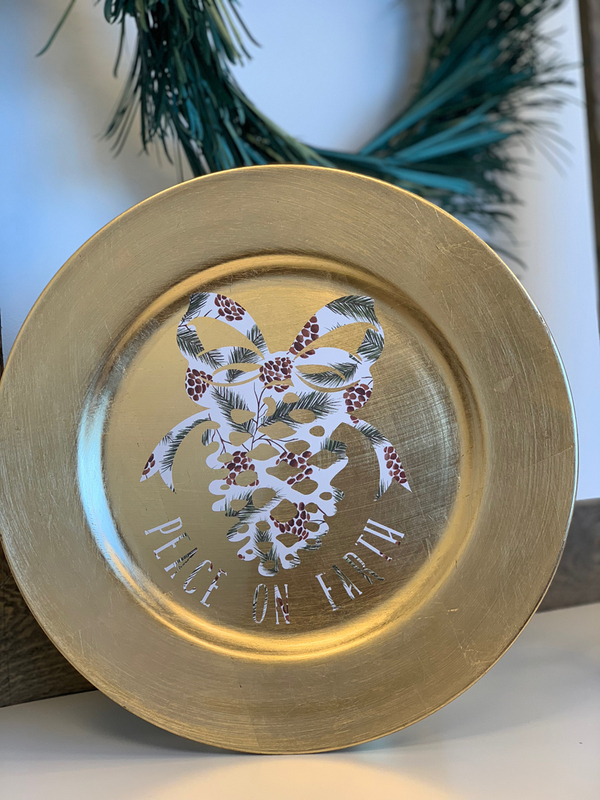 We used the removable vinyl so you could keep the pinecone in place and change out the phrase. Go from ‘Give Thanks’ to ‘Peace on Earth’ in just a few minutes. Confetti can either be a blessing or a curse. We actually cut ours larger so that it could be sprinkled as decoration on your empty table without having to keep a full tablescape up when no one’s around. 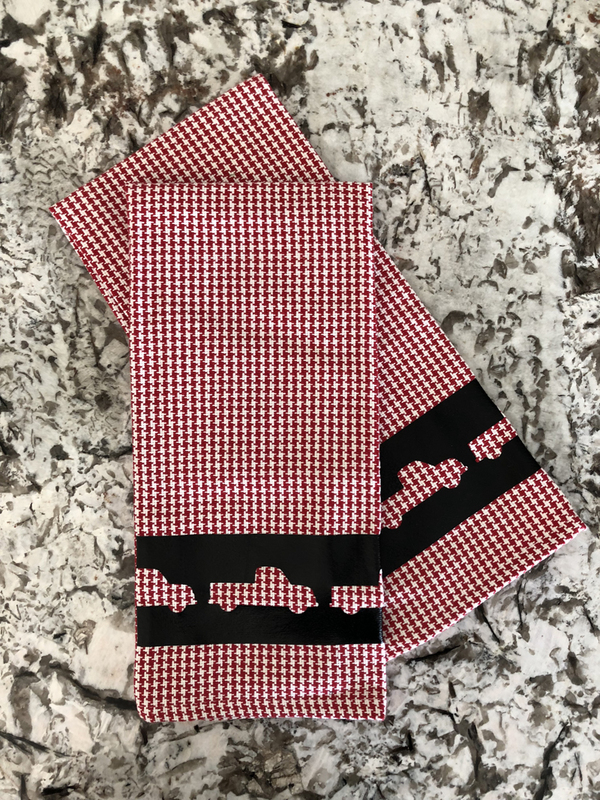 For easy kitchen garb, we made 3 different hand towel looks to match different pieces of the overall décor scheme. 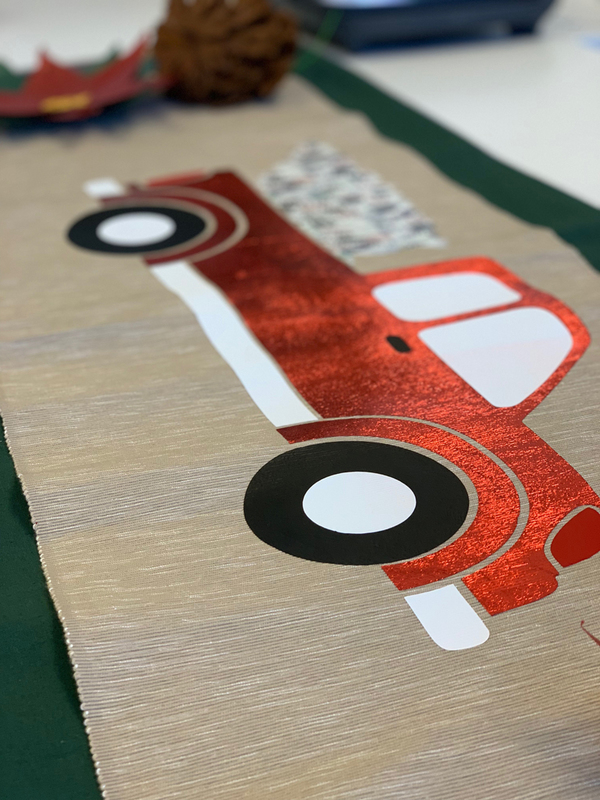 That way, you can have a new feel each week – from trucks to trees to mailboxes for Santa! Whew! I can’t believe we’re halfway through our series. Coming down the home stretch to Holiday Season! Maybe we missed it, but it looks like it’s been two weeks and there haven’t been any updates. If I missed them, will you please send me the link? Will the vinyl on the mug come off when washing? Also would you recomend hand washing? Hi. If you use permanent vinyl and handwash your mug, it should have lasting results. What happened to the last 4 weeks of the 8 week series? Mike Gutting, I am sure they are coming our way over the next 4 weeks! I hope so!!! Yes! I’ve been looking every couple of days since Nov 10 for the rest of the series. 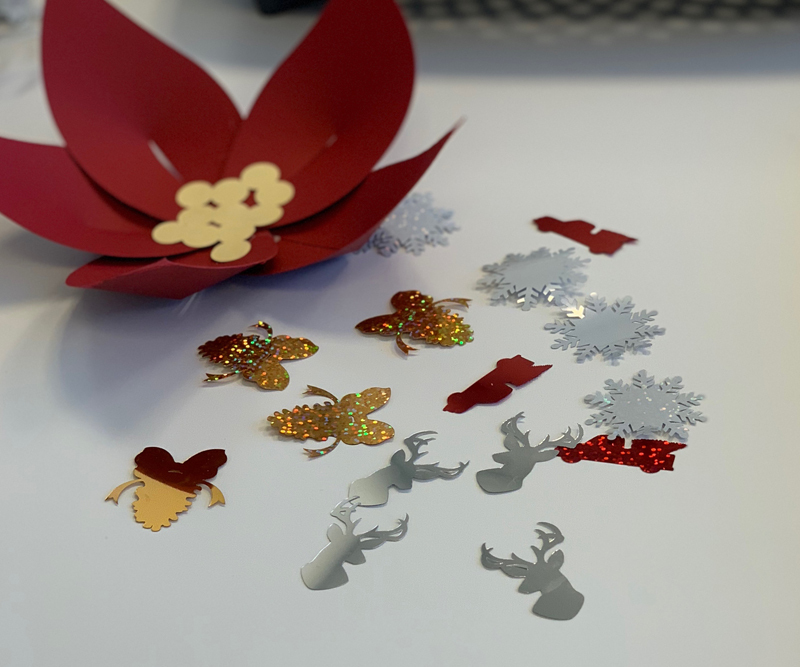 Can the cricut maker.cut out different circles and squares on the same page even if you don’t do it at the same time. I guess what I am asking can you tell it where you want the circle to be cut out on a page that has been used before. When you go to cut it. you can move the designs around on the mat preview, so you could move it to be on an uncut spot on such a page. Hi. You can get our machine by payments on HSN and QVC.